VietNamNet Bridge - A new species of damselfly has been discovered by a Vietnamese scientist, Phan Quoc Toan, director of the Center of Entomology & Parasitology Research at Duy Tan University. The article about the damselfly, discovered in Ngoc Linh Nature Reserve in Kon Tum and Kon Ka Kinh National Park in Gia Lai, was published in Zootaxa journal in early February. The name of the newly discovered damselfly species was named after the founder of the first and biggest university in the central region of Vietnam - Meritorious Teacher and Labor Hero Le Cong Co with the scientific name Coeliccia lecongcoi. As a nature lover, with a passion for beauty and insects, Toan spends a lot of time visiting forests in Vietnam where insect species help create a healthy ecosystem. Toan’s latest international publication is about a damselfly with a black back and yellow abdomen, with blue “cheeks”. Dragonflies are bioindicators used to assess the quality of water resources and ecosystems, and play an important role in agricultural development, contributing to the elimination of many harmful insects. Soon after discovering the differences in this species of dragonfly, Toan collected specimens and brought them back to study in the laboratory at Duy Tan University. The thorough research process helped Toan confirm that this was a completely new species. The newly discovered insects mostly live in small springs, interspersed with big rocks and dense vegetation in primeval forests. A report shows that about 400 dragonfly species had been identified in Vietnam. Prior to that, Toan in 2018 published the research work on another new damselfly species called Coeliccia duytan, found in Chu Mom Ray National Park in Kon Tum province. Both damselfly are endemic species that were found only in the Central Highlands. The research has laid the foundation for a long process of learning about the characteristics of damselflies and other insect species in Vietnam. In addition to the damselfly, Toan also researches other insects such as butterflies, beetles and cicadas and parasites that cause disease in humans. 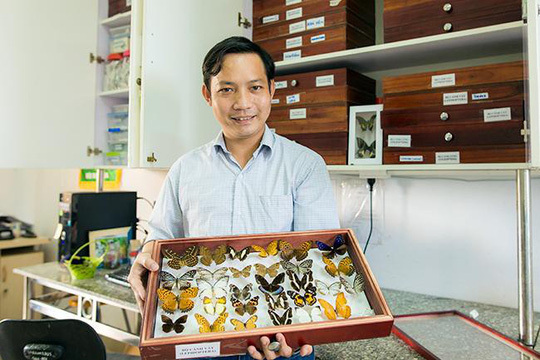 After obtaining a doctorate in entomology in Japan, Toan became a founder of the Center of Entomology & Parasitology Research at Duy Tan University. Asked about the reason behind his interest in damselflies, Toan said it is a semi-aquatic insect species which hunt other inspect species for food, from their larvae stage to adulthood. Duy Tan is a private run university. It has been named in Nature Research’s report - Nature Index 2018, as one of 10 units in Vietnam that lead in scientific publications. Is research in social sciences in Vietnam lagging behind?